At the time, Mother's Day was coming up, so I thought these would make pretty gifts. I found a tutorial by the owner of Drop Cloth Design Co. (Linda makes some of the most beautiful sets on Etsy) and tried a purple version for my mom and a turquoise version for Tal's mom. Linda's tutorial is detailed and well-written, so I'd definitely recommend following it if you want to try the project for yourself. I'll just share a list of exact materials I used and my extra tips/suggestions. + I didn't use a base coat, just two layers of acrylic paint. When I put these up in front of the window in direct light, they were a little transparent. If you want to use them as planters on a windowsill, it might be a good idea to do more than two layers. Just note that more layers will make it harder to distress effectively. 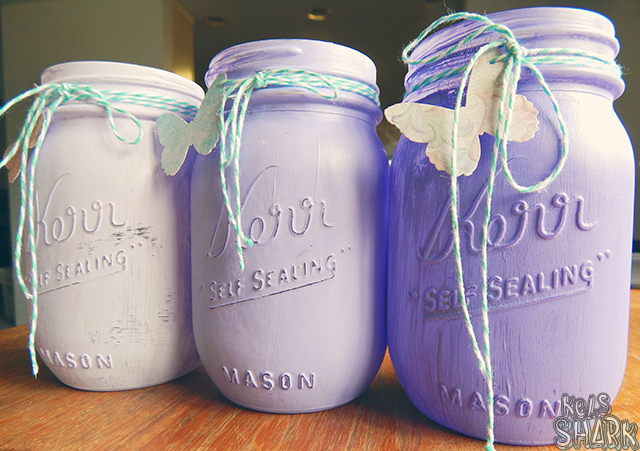 + Since these were gifts, I wanted to fancy them up a bit after finishing the jars. I took scrap pieces of pretty paper (thick paper is good) and hole punched butterflies or birds in them. Then, I used my Euro Punch tool to punch a tiny hole in each. You could easily use a needle or something else - I just had the metal punch handy. I wrapped a piece of baker's twine thrice around each of the jars' lids. After adding my hole punched butterfly/bird to the string, I secured it with a bow on the twine. + Even though the jars have a sealant protectant, I would avoid any usage where they have to be cleaned too frequently (especially on the outside). I would also be really careful if they were going to be used for any kind of food storage, too - I would probably just paint the bottom half or line the inside before spraying sealant. When I stopped by my parents' house, I snapped a photo of the purple set in use! My mom used sage, bellflower, and lavender flowers from her garden (unlike me, she has a green thumb). 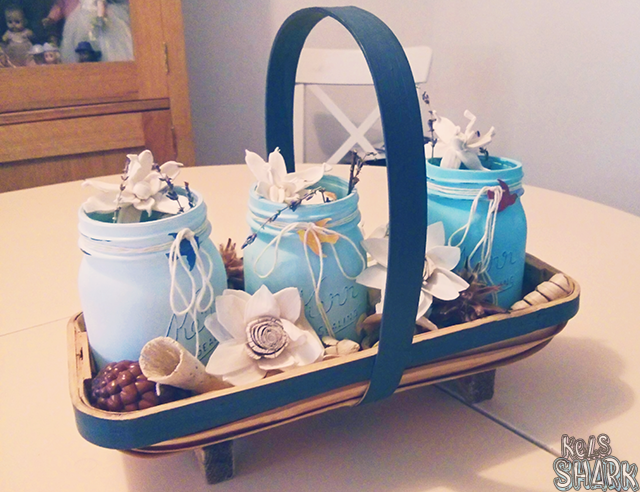 Tal's mom kindly sent us a picture of her jar set in use too! She put them in a pretty basket and filled them with the potpourri we gave her to go with it (the Gardenia scent from Pottery Barn - smells delicious and it looks like it's on sale right now if you're in the market for potpourri). Here are a few more ideas on how to use your set! + organize pencils, scissors, pens, etc. 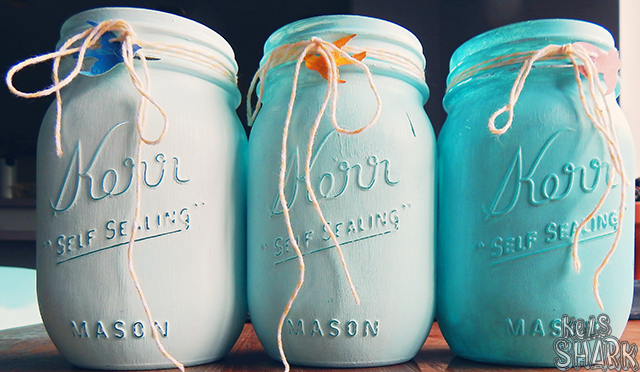 For more color scheme and usage ideas (or links to tutorials), check out my Painted Mason Jars board on Pinterest. Let me know if you have other cool ideas on how to use them (I made an extra turquoise set for myself) or decide to try making your own set - I'd love to see how it turned out! They turned out so beautiful! 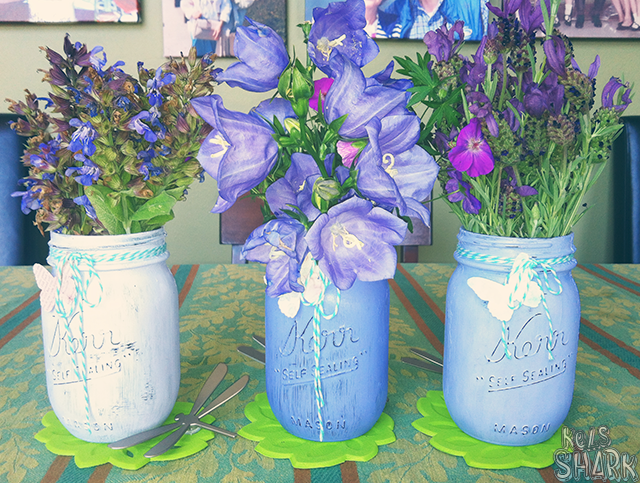 Your suggestions are spot on and I love how your mom and mother-in-law have styled their jars! Stunning! These are gorgeous, good job!